This set of stamps celebrates the marriage of Prince Harry and Meghan Markle on 19th May 2018. 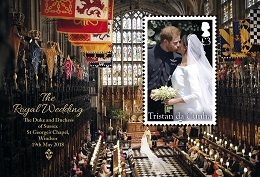 The stamps and pictoral borders show the happy couple. The sheetlet shows them in St. George's Chapel, Windsor.